This article is about the Amir of Afghanistan. For the pre-1947 Indian freedom fighter and post-1947 Pakistani political leader, see Amir Habibullah Khan Saadi. Habibullah Khan (June 3, 1872 – February 20, 1919) was the Emir of Afghanistan from 1901 until 1919. He was the eldest son of the Emir Abdur Rahman Khan, whom he succeeded by right of primogeniture in October 1901. His grandfather was Mohammad Afzal Khan. Habillah was the eldest son of Emir Abdur Rahman, born in Samarkand, Uzbekistan in 1871. He had a younger brother Nasrullah, born in 1874. Habibullah was a relatively reform-minded ruler who attempted to modernize his country. During his reign he worked to bring modern medicine and other technology to Afghanistan. In 1903, Habibullah founded the Habibia school as well as a military academy. He also worked to put in place progressive reforms in his country. He instituted various legal reforms and repealed many of the harshest criminal penalties. But one of his chief advisers Abdul Lateef was sentenced to death in 1903 for apostasy. He was stoned to death in Kabul. Other reforms included the dismantling of the repressive internal intelligence organization that had been put in place by his father. Habibullah maintained the country's neutrality in World War I, despite strenuous efforts by the Sultan of the Ottoman Empire and a German military mission (Niedermayer–Hentig Expedition) to enlist Afghanistan on its side. He also greatly reduced tensions with British India, signing a treaty of friendship in 1905 and paying an official state visit in 1907. While in India, he was initiated into Freemasonry, at Lodge Concordia, No. 3102. Habibullah was assassinated while on a hunting trip at Laghman Province on February 20, 1919. His assassination was carried out by Mustafa Seghir, an Indian spy, employed by Britain. Seghir was again hired by Britain to assassinate Mustafa Kemal Ataturk. He was arrested in Ankara and confessed that he received a regular salary from the British. He was hanged till death. 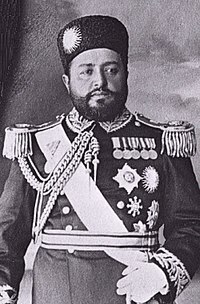 Habibullah's brother Nasrullah Khan briefly succeeded him as Emir and held power for a week between February 21 and February 28, 1919, before being ousted and imprisoned by Amanullah Khan, Habibullah's third son. This occurred a few months before the Third Anglo-Afghan War. ^ McMahon, Henry A (1939). An Account of the Entry of H. M. Habibullah Khan Amir of Afghanistan into Freemasonry. London, UK: Favil Press, Ltd. This page is based on the Wikipedia article Habibullah Khan; it is used under the Creative Commons Attribution-ShareAlike 3.0 Unported License (CC-BY-SA). You may redistribute it, verbatim or modified, providing that you comply with the terms of the CC-BY-SA.